Season 13 turned out to be my most productive Season, ever. Typically, my goal is to complete Chapter I, Chapter II, Chapter III, and Chapter IV. Doing so gives a player a full set and some goodies (such as a special portrait, a pet, and sometimes some wings). The most attractive thing about Conqueror (at least, for me) is that players who complete it receive extra Stash space. My off-season Stash is very full of items, even after I weeded some of it out. I was extremely motivated to earn some additional Stash space. Conqueror has a total of 8 objectives. I completed one of them before I was able to unlock Conqueror. That notification went by so fast that I was unable to fully read it. After I completed Destroyer and unlocked Conqueror, I got a better look at what that was. 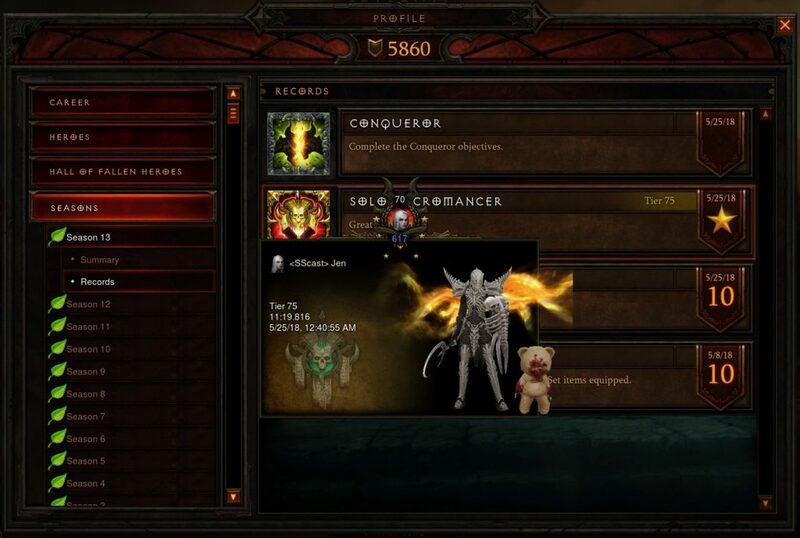 Take U There: Reach Greater Rift Level 60 Solo. 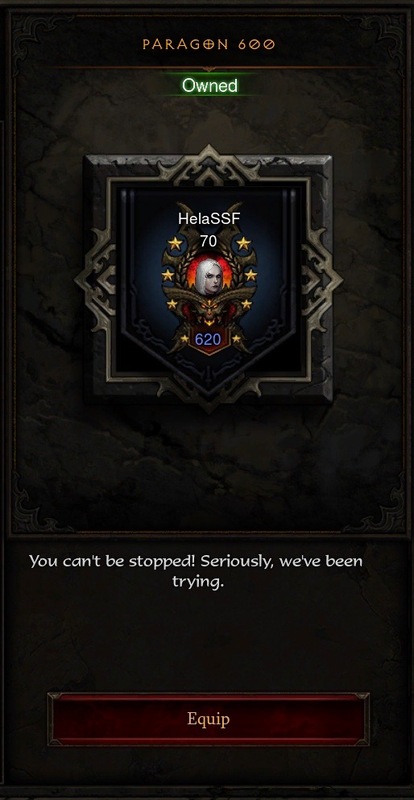 Greater Rift keystones can be obtained from any Nephalem Rift guardian. The next Conqueror objective I decided to work on was one that required a player to reforge a Legendary item in Kanai’s Cube. Unfortunately, I didn’t have enough Crafting Materials to do that – so I had to spend time running Bounties to collect more. In general, I don’t mind doing Bounties. I’ve done tons of them in Season 13 specifically to obtain Crafting Materials so I could put as many items as possible into Kanai’s Cube. I don’t want to run into the problem of dragging too much stuff back with me out of Season and have absolutely nowhere to put it in my non-season stash. If I would have known that I’d need at least 5 of every Crafting Material in order to complete a Conqueror objective, I would have saved some. But, I didn’t know because I’d never done Conqueror before and because I rarely ever look up game-play stuff online. We were reaching the end of Season 13 and I had to spend precious time running Bounties. It was kind of frustrating. Cubic Reconfiguration: Use Kanai’s Cube to reforge a Legendary item. The next objective I worked on was unnecessarily confusing. Power Amplification requires players to use Kanai’s Cube to Augment an Ancient item. The information on the recipe says you need one Legendary Gem, and one Ancient item. The level of the Legendary Gem varies depending on what kind of Ancient item you want to Augment. I decided to Augment my Ancient Reaper’s Wraps (which is a bracer). I’d been using it for most of Season 13, and it seemed like a good choice. This meant I needed to have a Legendary Gem that was Level 50. I did not have one of those yet. Players also need 3 Flawless Royal gems (of whichever kind they choose). A good friend who was watching my stream at the time I was working on this objective was able to provide some excellent advice. Without his help, I’m not sure if I would have figured out how to do this objective. Or, I would have had to go out of game, search the internet for more information, and then go back in-game to try again. My friend suggested I create 3 Flawless Royal Topaz gems, because those have Intelligence and I was playing a Necromancer. I learned that it takes time to level up enough Gems to get what I needed for the objective. So, there are at least two time consuming objectives in Conqueror. It also costs a lot of gold to level the amount of Gems I needed – so this objective is both a time sink and a gold sink. So far, (with my friend’s advice) I was able to follow the recipe and level up some Gems. Problems arose when I ran out of Topaz gems before I was able to get 3 Flawless Royal Topaz. My friend pointed out that players can convert Gems in Kanai’s Cube. In other words, put in a Gem type that you don’t need and change it into a type of Gem that you do need. The recipe is called Darkness of Radament. It requires 9 of any Gem, and one of the following items: Essence of Amethyst, Essence of Emerald, Essence of Ruby, Essence of Topaz, or Essence of Diamond. The recipe doesn’t have any clues about where to obtain those. I remembered that Squirt the Peddler (a vendor in Act II) sells the Essence items. It was no problem to take the Waypoint to where Squirt is located. But, which one did I need? I wanted to change Ruby Gems into Topaz Gems. Was I supposed to use an Essence of Ruby, or an Essence of Topaz? There is nothing in the game that clearly explains that. My friend, having done this before, knew that I needed an Essence of Topaz. (I bought both before I read his advice in my Twitch chat). I asked him how he figured out how to Augment an Ancient item – and he said he had looked it up online. The Essence items are expensive. I was fortunate to have enough gold to buy what I needed (and one I didn’t actually need). What if I lacked the amount of gold that was required? Then the objective would take even longer to complete as I went about obtaining more gold. Add that to however long it would take if my friend didn’t happen to visit my Twitch Channel at that moment and provide me with the instruction that Blizzard didn’t include in-game. In my opinion, if players have to go out of game to figure out how to do something – this is a failure on the part of the company that made the game. I wasn’t trying to do something strange just for kicks – I needed to Augment an Ancient item in order to complete the Conqueror part of the Season Journey. Blizzard didn’t provide enough explanation for someone new to this part of the Season Journey to intuitively figure this out the first time they encounter it. After learning what Essence I needed to put into Kanai’s Cube – I had to spend more time at the Jeweler leveling the Ruby Gems up until I could make 9 Royal Rubies. The next step was to put those 9 Royal Rubies into Kanai’s Cube and convert them to a Royal Topaz. Then, it was back to the Jeweler to convert the Royal Topaz into one more Flawless Royal Topaz. Doing so would give me the three that I needed to Augment an Ancient item in Kanai’s Cube – and complete the Power Amplification objective. 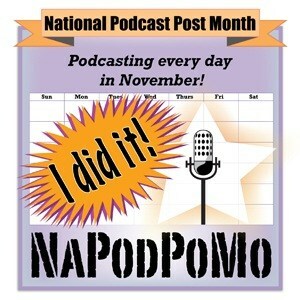 By this point, I had forgotten what objective I was working on or what else it required. After all that, I re-read the objective and was reminded that I also needed a Legendary Gem that was level 50 – that I didn’t mind destroying in order to use it for the Augment. I’d been messing around with Gems for so long that I forgot I needed a level 50 Legendary Gem to do the objective! Earlier in the Season, I leveled a Legendary Gem to 35 – and later learned that it wasn’t the best choice for my Necromancer to use. So, after all the confusion and frustration involved in leveling up Gems, converting gems, and figuring out which Essence item I needed – I now had spend time doing Greater Rifts to get this Legendary Gem to 50. My suspicion is that Blizzard intentionally put two time consuming objectives into Conqueror because they wanted to make it extra difficult for players to finish it. The reason I wanted to work on Conqueror was because players who complete it get an additional Stash tab. It seems like Blizzard really wanted players to have to work hard for that Stash tab! The next thing I needed to do was run some Greater Rifts and level up a Legendary Gem to Level 50. 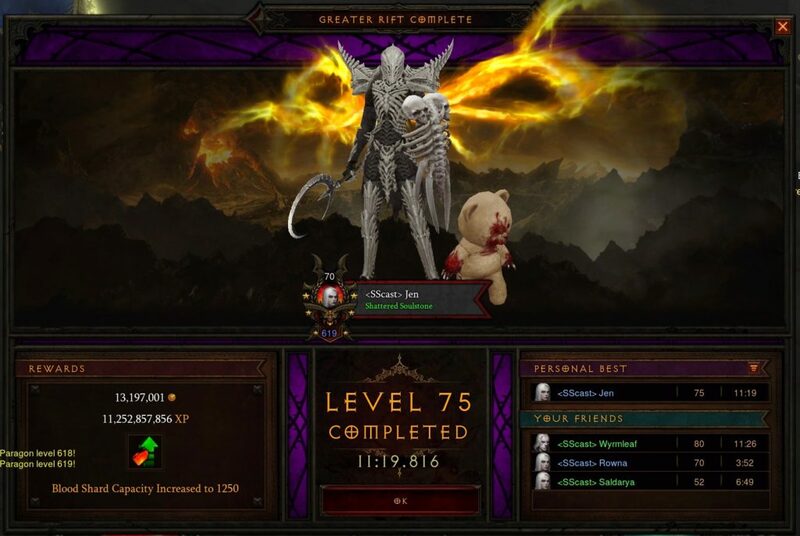 I started with on that was Level 35, and ran a Greater Rift 50 a few times. To make things go a little bit faster, I paid some gold so I could get extra chances to level up a Legendary Gem. Eventually, I needed to move up to a slightly higher Greater Rift to get the Legendary Gem to 50. Power Amplification: Use Kanai’s Cube to augment an Ancient Legendary item with a Level 50+ gem. In the video above, I completed the Guardian of Sanctuary objective. After finishing some very time consuming objectives, it was really nice to be able to complete one that was quick. 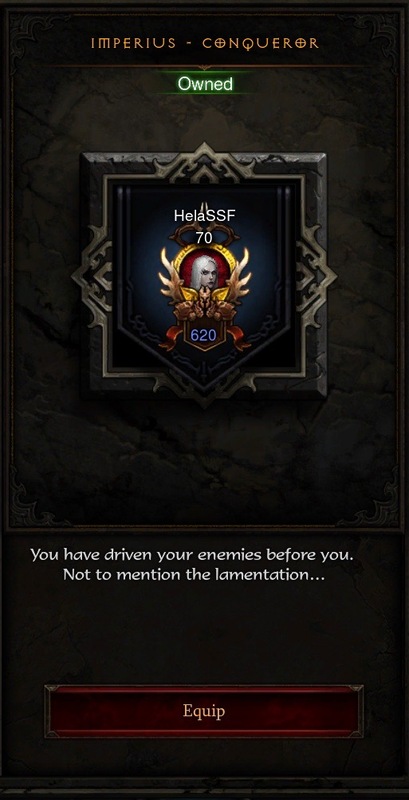 Guardian of Sanctuary: Finish a level 70 Nephalem Rift on Torment XII difficulty within 5 minutes. Gem of My Life: Level three Legendary Gems to level 55. I hit Paragon 600 – for the first time ever – at the same moment I turned in a Greater Rift 70. My goal for Season 13 was to hit Paragon 500, which I thought was a reasonable goal for me while playing in the Solo Self Found League. I never expected to hit Paragon 600 this Season. Players that hit Paragon 600 get a special Portrait Frame. You can’t be stopped! Seriously, we’ve been trying. In order to finish the Destroyer part of the Season Journey, players had to complete one Conquest. Conqueror required players to have completed two Conquests (total). The Conquest I picked for Conqueror required players to complete Greater Rift 75 solo. Divinity: Reach Greater Rift Level 75 Solo. There were two Conqueror objectives left. One of them was something I was certain I could complete. The other one… was a bit confusing. Walking Into Spiderwebs: Kill Cydaea at level 70 in under 30 seconds on Torment XIII difficulty. It didn’t take long for me to kill Cydaea. I got this objective completed on the first try. The last objective was confusing, but it wasn’t intended to be. It turned out that I was overthinking it. To complete the Money Ain’t a Thang objective, a player had to kill Greed. 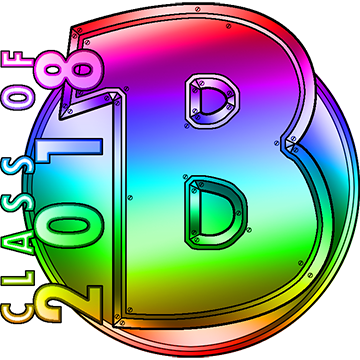 The only way to get to Greed was through a portal. I had heard that it was possible for a Puzzle Ring to spawn a portal to The Vault. Season 13 is nearing its end, and that gave me plenty of opportunity to collect a few Puzzle Rings. So, I grabbed one, and put it into Kanai’s Cube the same way I put other Legendary items in it. The Puzzle Ring was now inside Kanai’s Cube, and I could select it. This is not how to get a portal to the Vault. What I was supposed to do was much easier. Take the Puzzle Ring. Put it into Kanai’s Cube without any Crafting Materials. It goes in all by itself. Hit “Transmute”. A glittery portal to The Vault will appear near the location of Kanai’s Cube. Money Ain’t A Thang: Slay Greed on Torment XIII difficulty. Treasure Goblins outside of Nephalem Rifts will sometimes open portals to Greed’s domain, The Vault. 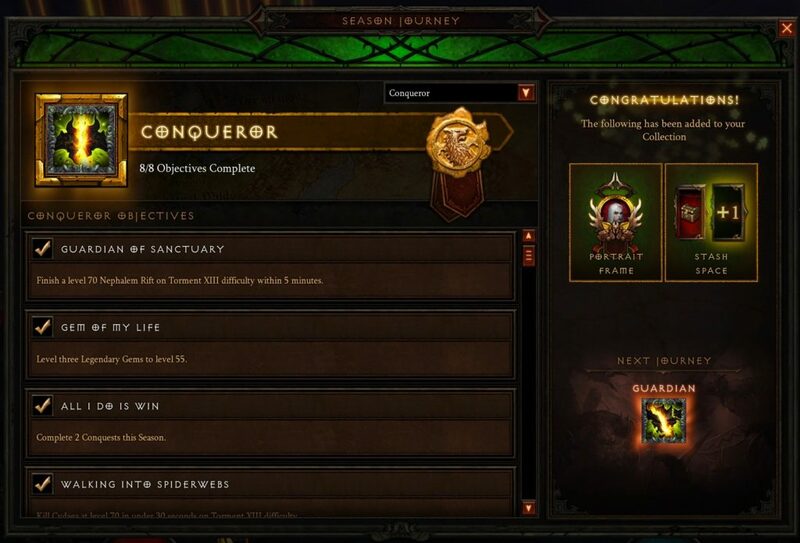 I have completed the Conqueror part of the Season Journey for the first time – ever! It is going to be wonderful to have some additional Stash space for my non-Season Softcore characters to fill up. The loot I collected in Season 13, and the amount of stuff I put in Kanai’s Cube, will make it possible for me to get rid of some more of the items that are in my non-season Stash. In addition to getting more Stash space, players who complete Conqueror get a special Portrait Frame. 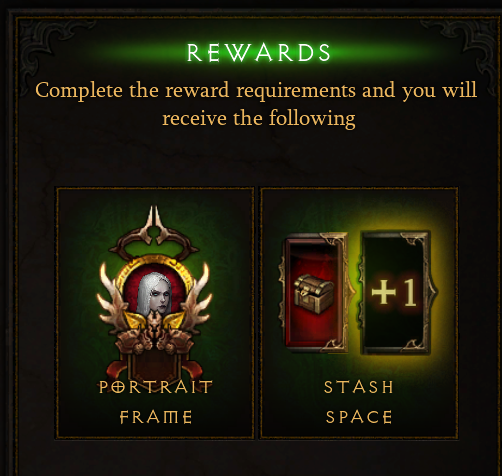 Season 13 featured the Imperius Portrait Frame. There was still some time left before Season 13 would come to an end. My next goal is to complete Guardian – the final part of the Season Journey. 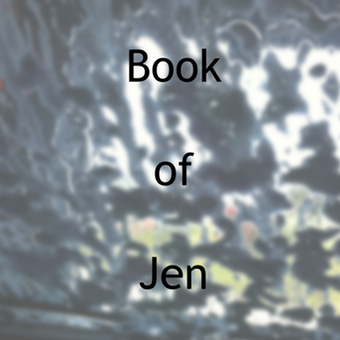 Conqueror (Season 13) is a post written by Jen Thorpe on Book of Jen and is not allowed to be copied to other sites.